We can all agree that when your furnace breaks down it can be quite a fearful and frustrating experience. Not only is it inconvenient, especially in the dead of the winter, but surely the repairs or replacement can be quite costly. 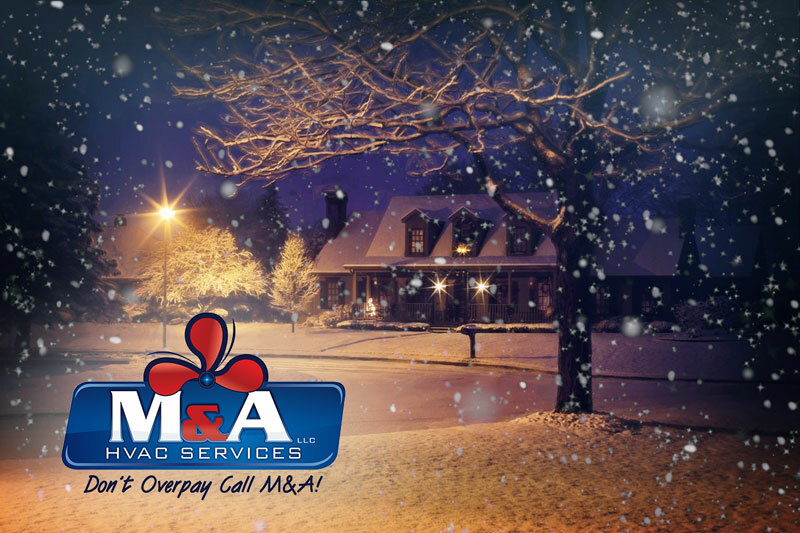 With that in mind, the folks here at M&A HVAC Services, LLC want to share with all our valued clients steps to take to avoid a heating system breakdown this winter. We certainly don’t want you to get caught in the cold, nor have to make that emergency call when your furnace won’t kick on. These important tips are sure to keep your furnace running safely, efficiently and smoothly winter after winter, year after year. First and foremost, it is important to engage in annual routine maintenance of your heating system. Routine maintenance is a surefire way of identifying problems early on. During a routine maintenance visit, our highly skilled and trained technicians inspect and clean all your system’s vital components and ensure that they are functioning properly. In addition, if any problems are identified, they provide fast, efficient and effective solutions. Next, it is imperative that you replace the air filters in your furnace regularly. Clean air filters enhance the air quality in your home and help your system to run efficiently. When the air filters are dirty or clogged with all types of contaminants, the airflow is restricted causing your system to work harder and longer, which can ultimately lead to that unfortunate heating system breakdown. Most homeowners are under the impression that closing the vents in unused areas of your home when your furnace is running will help to direct more heat into specific areas of the home. This could not be farther from the truth. When you close the vents in the unused areas of your home, you can create a variety of problems. Since your furnace is sized to accommodate the heating needs of your home and maximize both the output of heat and its overall efficiency, closing off specific spaces in your home does not allow your furnace to perform at its peak levels and full capacity and may cause it to cycle inefficiently and incorrectly. When your furnace is forced to operate via frequent short heating cycles, the lifespan of your unit is affected and your home’s heating needs are not met. Be sure to leave all vents open so as to allow your system to function at full force. Finally, if your thermostat runs on batteries, be sure to change out your batteries early on. Dead batteries are a common cause of malfunctioning furnaces believe it or not. If your batteries are weak or dead, then your thermostat will shut down. When the thermostat shuts down your furnace will surely stop running. We highly recommend you change out the batteries in your thermostat at least twice per year to avoid any interruption in providing comfortable temperatures in your home. We hope you have found these tips useful and want to remind you that if you are in need of any type of HVAC parts, repairs or services then we are the team for you. Since furnace maintenance, service and care can be somewhat complex and indeed critical to the overall operation and function of your HVAC system, it is always best to rely upon the professionals here at M&A HVAC Services, LLC to get the job done. Take advantage of our quality HVAC services to avoid a heating system breakdown this winter. Simply give a shout out to our team to schedule your inspection, cleaning or other routine maintenance service today. We look forward to serving you and send along wishes from our family to yours for a safe and happy holiday season ahead! !